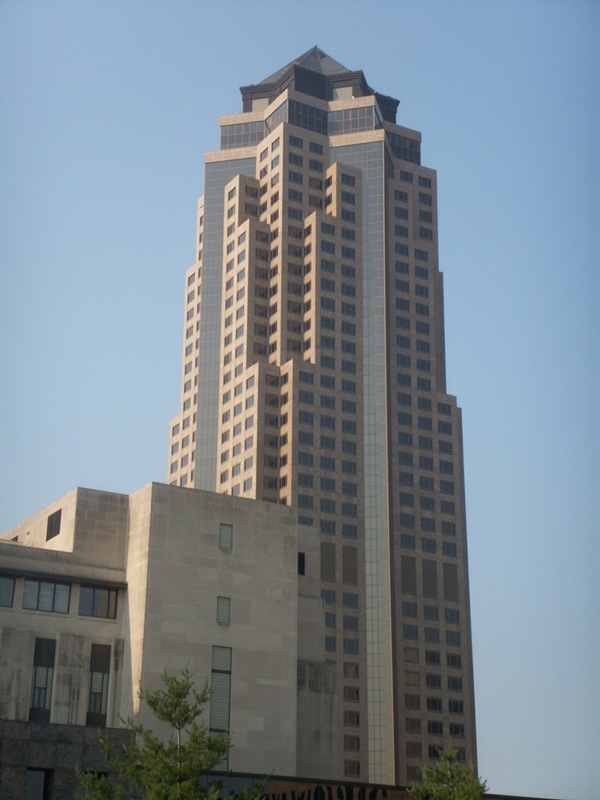 Standing 630 feet tall, 801 Grand in Des Moines is the tallest building in Iowa. 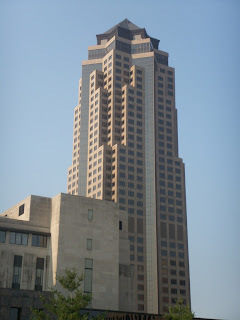 It has also been known as Principal Tower, and Principal Financial Group Building. The tower is designed in postmodern architecture, with a caisson foundation. It is made from aluminum, copper and granite and has a curtain wall façade. The 45 floor structure was completed in 1991 after two years of construction. The first three floors of the building offer shopping and dining options, and the third floor connects with the city skywalk system. There is also a private restaurant on the two upper floors. The upper half of the building is distinguished by several setbacks and terraces. This was done to minimize its appearance in the Des Moines skyline as well as to maximize corner office space. The top of the tower features an eight sided copper clad pyramid. This copper was placed in hopes that oxidation would cause it to turn green, like the statue of liberty. The climate conditions did now allow this to occur, and the top ended up with a brown appearance instead. 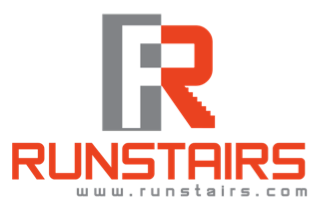 Click here to see a full listing of the tallest building in each of the 50 United States.